The No. 16 Kentucky Wildcats defeated the No. 13 Tennesee Volunteers on Thursday night in Knoxville 73-71 as the Cats won their first game against the Vols on the road since Jan. 2014. Despite some significant foul trouble and an injury to Taylor Murray that forced her to sit out the second half, Kentucky held off a relentless Tennessee team to earn their first statement win of the season. Let’s discuss how the Lady Cats were able to get it done. Kentucky’s top two scorers, senior Maci Morris and star freshman Rhyne Howard, struggled to stay on the floor due to constant fouling. Howard showed her youth after picking up her third and fourth fouls only a couple minutes into the second half. She had already missed a considerable amount of time once she picked up two fouls in the first half and played less than three total minutes in the second half before ultimately fouling out. Morris, who was the Wildcats lone source of offense for the basically the entirety of the second half, was also trying to keep herself off the bench. She picked up her third foul not even a minute in the third quarter and made it all the way until there was under four minutes remaining in the game before fouling out. The foul trouble was infectious, apparently, as both Tatyana Wyatt and Ogechi Anyagaligbo – who had her best game of the season – also finished with four fouls. Jaida Roper picked up three fouls herself. Foul trouble was the reason Kentucky faced a massive early deficit against the Mississippi State Bulldogs earlier in the week. Against Tennessee, the Cats were much more prepared. An early 7-0 lead was eventually ballooned to a 22-5 advantage – thanks largely to Morris – giving Kentucky a comfortable cushion while sorting out their rotations amid foul trouble. The most important stretch of this game was the final four minutes after Morris fouled out with 27 points. Without Morris, Howard, Murray and only a four-point lead, the energy on the Kentucky bench drained. The offense struggled to find a rhythm and Tennessee was slowly chipping down the lead. Once Morris fouled out, I don’t think there was one Kentucky fan who believed they could pull out the win. But some unbelievable resiliency and the biggest shot of Jaida Roper’s life willed the Cats to a win. While it wasn’t an ideal scenario, those late four minutes showed this team’s true colors. They don’t need their three best players to be competitive. Tennessee is a really really good team and they were outplayed and outmanaged by Kentucky’s bench. Roper and Anyagaligbo both deserve the game ball for how they kept their heads high and rose to the occasion. Losing this game would have been a major disappointment, even with how the game worked out towards the end because Kentucky practically controlled the game throughout. It felt like Kentucky had to “hold on” to a late lead, but the players on the court weren’t playing to hold the lead, they were playing to win. Teams like Kentucky need that adversity to hit at the most inopportune times so they can prove just how legitimate they are. This was a statement win for a team coming off a demoralizing loss at the hands of a top-10 opponent. It can’t be emphasized enough how impressive it was for the Wildcats to lose by double-digits on the road to a ranked team and then beat a ranked team on the road without their three best players down the stretch. A quick update on Taylor Murray following her scary fall that sidelined her for the entire second half. According to head coach Matthew Mitchell, Murray did not suffer any ligament damage, which is fantastic news if you saw the injury live. I think a lot of us were expecting the worst, but she was able to walk off the court under her own power and watched the second half from the bench with an ice pack wrapped around her knee.
. @UKCoachMitchell says that Taylor Murray has a bone bruise and is listed as day to day but great news overall that there is no ligament damage. With Rhyne Howard playing a season-low 14 minutes, Morris knew she had to take matters into her own hands. She reminded everyone just how good she is. Morris was knocking down any and every shot she attempted. If the defender was right in her face, she’d fire anyways. If she curled around a screen for a contested jumper, she plopped it right into the basket. She drew charges and played smart defense despite dealing with foul trouble. She attacked the rim to open up the floor. There wasn’t a more impressive player on the court for either team. She finished on 10-16 shooting from the field and was 4-6 from three. If she hadn’t fouled out, there is no doubt in my mind that she breaks 30 and probably pushes Kentucky to a double-digit win. She was simply unstoppable and that’s why her absence appeared to spell doom for the Cats. Morris’ 27 points moved her into the top 10 scorers list in program history. Still up thinking about our big win tonight? Even though Kentucky starts four players who are at least six-feet tall (Morris, Howard, Wyatt, and KeKe McKinney) they have been dominated on the boards over their last two games. Against Mississippi State and Tennessee, Kentucky was outrebounded by a combined total of 53 to 25 on the offensive glass and 45 to 31 on the defensive end. Those offensive rebounds translated to 45 total second-chance points for the opponent and 84 overall points in the paint. Watching MSU or UT grab multiple offensive rebounds on one possession was incredibly frustrating, but something Kentucky sacrifices in favor of smaller, quicker lineups who can run you to death. That scheme was unsuccessful against a clearly better MSU team but proved capable against a more evenly matched UT team. Only one Kentucky player ranks in the top-20 among SEC players in rebounds per game (Howard is 12th at 6.9 per game) and the team ranks second-to-last in the SEC with only 31.7 rebounds per game. For comparison, Tennessee is second at 40.1 and Mississippi State leads the conference at 42.1 per game. Interestingly enough though, Kentucky ranks third in the SEC in total offensive rebounds at 208, behind both MSU and UT. 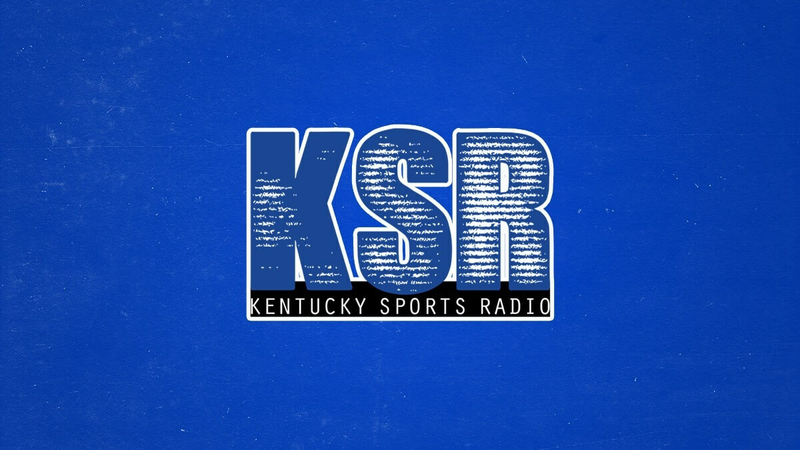 Kentucky will face Vanderbilt in Memorial Coliseum on Sunday at 1 p.m.
Great report and win for UK HOOPS. Mitchell has a lineup of tough contributors along with talent. Kentucky actually will face Ole Miss, not Vanderbilt, in Memorial Coliseum on Sunday at 1 pm.